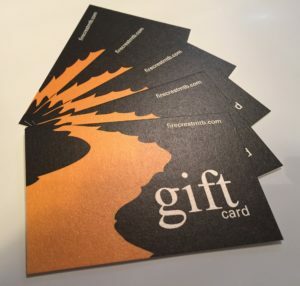 Firecrest Mountain Biking’s Gift Cards make a great gift for Christmas, Birthday or at any time of the year. You won’t find ‘confidence’, ‘speed’ ‘beating your mates’, ‘setting a PB’ ‘getting more air’, ‘floating off drops’ or ‘having more fun’ in the shops to buy as a gift. With a Firecrest MTB Gift Card you can give all of these and more to the Mountain Biker in your life. Firecrest Mountain Biking’s Gift Cards can be for anything from a ‘Value of” £25.oo upwards through to one of our 3 hour 1-to-1 Mountain Bike Skills Courses. The Firecrest Gift Cards come in a presentation pack which includes the card, booking information and an envelope for the card so you can give it as a surprise. Additional participants can be added to the course at £10.00 per rider per hour. If you’d prefer to order your Gift Cards via e-mail please contact us and we’ll send you a Gift Card Order Form and Payment Details.